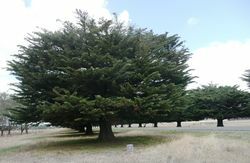 An avenue of mature Monterey cypress pine trees planted in 1919 commemorates those who served in World War One. Most of the trees are marked with the name of the soldier they commemorate. 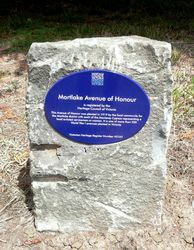 The Mortlake Progress Association has completed its plan for placing a memorial avenue of trees to the soldiers along the Darlington Road. With the help and co-operation of the Council the trees to the number of nearly 100 were provided, and the ground made ready for the guards. On Tuesday afternoon, in delightful weather the planting took place, in the presence of a large number of relatives and friends of returned soldiers, and others. The President of the Shire (Cr. W. J. T. Armstrong) planted the first tree, and the remainder were planted by friends, relatives or soldiers themselves, each tree for a "digger" was tabulated and a record kept so that later on plates, with name, etc., may be placed on the guard, and it is intended to remove the plate to the tree trunk at a still later date. The day was almost the anniversary of the declaration of war against Germany by Great Britain in defence of Belgium five years ago. Camperdown Chronicle (Vic), 7 August 1919.